As you all know, October 10th (or 10/10/10), was the date of this year's Good Life Fitness Victoria Marathon. It also signifies the 2500th anniversary of the first ever marathon that was run. The story of that race can be found here in an informative but short read. I have always been told that Victoria is a great first time course and a lot of people really enjoy doing it so naturally I selected this race for my first marathon. The training was intense and I dedicated myself to it with 100 percent of my ability. I had put in the work and was ready to go. I took the 11:00am ferry and was traveling with some friends I met through my work at Sigge's. We made perfect timing with our ferry arrival and had no problems getting on. Before we loaded, I treated myself to a coffee from Starbucks and found some other team mates that would certainly liven up the 1.5 hour ferry ride into Swartz Bay. We were all full of energy and very excited to be together for this experience after all the work we had put in together in training. The trip was pleasant and the rain had stopped entirely. I was sure that the weather would hold out for the race as the weather reports called and could see patches of blue poking through the clouds. I know the post storm winds could be an issue but no biggie as they were only calling for 20km/hr winds. We drove into Victoria found some parking and headed over to the race expo at the convention center to pick up our race packages. There was a lot to see and plenty of booths with information about new running products. I particularly enjoyed listening to Silken Laumann talk about young Canadian athletes and her experience as an athlete. She seems like a wonderful person. Her and her husband GoodLife Fitness' founder and owner David Patchell‐Evans are doing incredible things for the local charities by donating all of the profits from the event to twenty different local charities. Take that Grand Fondo organizers!! It's nice to make a buck or two when you really need it, but it's even better to be in a position to raise some bucks and give them to those who are truly worthy and in need. After the expo we were starting to get hungry. We had some time to kill before checking in and decided to grab some quick food to go and drive the course for those of us who hadn't seen the course before. Myself and one other runner in the car were début marathoners who have not even seen this course. Not even mentioning the stunning scenery which was playing an effectively successful roll of distracting me from the task ahead. "Enough with the tourist scene, keep your head in the game." I had to keep telling myself. This stunning course is on the very south western point of Canada. I was trying to take in all 42.2 kms of hills, exposed areas, landmarks and my game plan based on how I may be feeling at that point. I was surprised to see how hilly the course actually was. Provided that none of the hills were too long or steep, I wasn't worried in the slightest about the undulations. In fact, I really enjoy testing myself and competitors going up and over these hills. One's ability to recover atop the hill and push through will determine weather or not he or she has what it takes to persevere and maintain their projected pace. I had been given heaps of advice about what to do during this race. The answer and only thing I said to myself going into and during this race was that I have to run the same pace for the entire race NO EXCEPTIONS. I pictured myself picking up the pace to try to match my goal pace (3:35/km) while running up these hills. I obviously would not be able to maintain this speed on all the up hills and would definitely gain some on the way down. Visualization and positive energy are key to being a champion and meeting your goals. I believe you can put two equally skilled runners up against each other and the one who has the most belief and who has mentally prepared the most will certainly succeed. After seeing the amount of corners and hills out on course I was starting to wonder why everyone had given this race such an "easy course" review. Dinner company and conversation were great, but the menu was sadly lacking at Rick's grill for the pre marathon health nut. I wish I was at the Raw food restaurant that I had been to the last time I was in Victoria. After a spinach salad and glass of Sauvignon Blanc, It was back to Paul's Motor Inn for a solid sleep. I watched some TV and ate the last of my brown rice goulash which I had prepared earlier in the week and had been eating ever since. My mega nutrient rich preparation for this race. I knew I would need something more substantial for lunch and dinner so I brought a huge container of it. Off to bed without a hitch, good night. I Awoke to the sound of my friends leaving to go run their half marathon. They must have been creeping around like mice because I only heard them as they were leaving and was able to say good luck to them before they left. I tried to go back to sleep but it was just under half an hour before I was scheduled to wake up. I lounged for a bit then got up and had a nice hot shower. I prepared my drinks for the elite table and drank my MonaVie EMV and my Active and M-Mun. I love starting my day this way as it makes me feel fantastic without the crash from my high test coffee. Not to mention the health benefits. I put on my brand new race uniform from MonaVie and my "Beat the Bus" broken in Asics Hyper speed 4's from ForeRunners. I was healthy and confident and for once in a very long time, I was relaxed and had zero stomach issues. As far as race mornings were concerned it was a great sign of things to follow. I knew I had the training and had been chasing VFAC champions for months to get to this point. It was time to jog over to the start line. I needed to be there half an hour before the start to drop off my bottles for delivery along the course. Everything was falling into place. I met with several team members and runners from around the lower mainland and we all shared excited re-enforcement and good luck all around. I warmed up and did some strides. I met with a Kenyan who I later found out was in my age group and looking to run a 2:18. I wasn't surprised to hear him say that and returned to the line for the start. The count down started and I let out a large cheer and a "Have a great race everyone!" I find it's a great way to take the edge off and settle down at the start of the race. We round the bend and head through the gated sections and crowds in the down town core of Victoria. It was a beautiful morning! Nice and cool and the rain had stopped early in the morning. The roads were dry so we could count on good traction and light weight from being dry. Imagine being one pound heavier because you are wet, now understand that the average stride length for a runner is 1 meter. There are 26 200 meters in a marathon henceforth making your journey 26 200 lbs heavier over the distance. God I'm obsessed, back to the race. We headed around the bend and up the first staggered hill. I was just behind a runner and right on pace. The packs were starting to form as we entered the 2.5 km mark and I figured I might catch up to this young man and ask him what his plan was. I know it was early, but I didn't enter this event to mess around and wanted to set up my parameters before I found myself in a senseless battle. I quickly found myself with a 25 year old man from Vancouver who I had been expecting to be running close to my time. To honor of his efforts and valiant début, his name was Ed McCarthy and he was the only runner in a group of five or six of us aside from myself who was able or willing to do any sharing of the wind drafting and pace keeping. Up to the half way mark there were no real events worth noting and our pace was right on the money. Ed and I pretty much split the first half in half. Taking turns drafting and pacing. After the first half (and a loud horn blast from my team mate's air horn, Ed started to pick it up and became very excited when he saw some friends. He was after all only 25 and on his first marathon, but what made it even more unbelievable, is that as we passed the half way mark, he said "First half ever in 1:16, not bad." "You mean that you haven't even run a half marathon yet?? I questioned him almost annoyingly. "I guess not." he replied modestly. After that he proceeded to maintain a slightly faster speed than I was willing to run and I warned him to slow down. He agreed after a short time and we were back on pace before long. Just after the half way station was the next water station and I was certainly in need of some replenishment. As we approached the table, I looked amongst the bottles for the one with the D on the lid and the duct tape around it. I thought I had it and grabbed hold of one only to realize I had grabbed the wrong one and now needed to run back to put it back and hopefully grab mine. I did find mine after about a four second stop and had to sprint to catch up to the pack. I didn't catch up to them until right at the turn around point at the top of the hill. after the turn around, we went downhill back the way we had just came. I was thinking we might have caught a break from the wind as it seemed to be in our face from 18 km to 21km. It was in our face again on the way back into the course. There was some small aches in my legs at 30 km. I focused in on my form and maintaining my pace and the pain disappeared. At this point, Ed had dropped back a bit and the man from Costa Rica was just off my shoulder now as we reeled in another runner. As we upped a hill and rounded a bend, the wind howled fiercely as we exposed ourselves to the ocean at around the 37km mark. We were getting beaten by the wind mercilessly out on course, but it was extremely difficult to manage between the 33rd and fortieth km. I almost begged for someone to help trade drafts as I was suffering greatly running into the wind after leading the pack since half way. There was nothing anyone could do to hold on and they fell back as if we were running into gun fire. I ducked my head slightly and swung my arms trying to keep an aerodynamic profile as I gritted through. I could hear my virtual partner beeping at me to speed up even going downhill. I gritted my teeth and pushed hard into the wind hoping to maintain the pace which I had worked so hard to keep up to this point. I could feel my pace slipping from my grasp as I ploughed through the wind. At the half way point, I was in 15th place. I had just heard someone shout out that I was in 9th place and could see someone up ahead in a red singlet who I appeared to be closing in on. 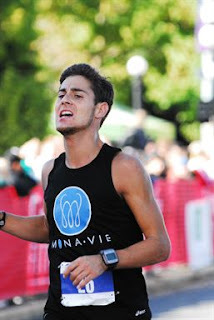 My pain was momentarily put on freeze as I passed this runner who I recognized to be in a hopeless state of disbelief. After all we were just 3kms from the finish line now. I saw his glance and exchanged a look of disbelief as I realized how good of an auto pilot my training had left me with. After passing this runner I crested the hill and faced more wind as I looked back over my shoulder in a blur of last minute fear. There was no one in sight behind the runner who I had just passed so I figured I was set now for a top ten position. I knew that if I just kept my legs moving (which at this point was the most I could do) I will have met two out of my three goals which I had set for myself in this race. When I entered this race I wanted to be in the top ten over all and top three in my age group and I was also hoping to run a 2:30-2:35 for my début. These were the goals which I had watched crumble for others as the wind tore them apart or they were just not having a great day. I had come a long way and was now out of the wind. there were a few subtle inclines and a lot of turns as I zigged and zagged into the last 1200 meters. Just before this and as I was approaching 800m to go, my eye sight was flickering in and out and flashing white. I kept smacking myself mentally to keep focused on the next corner trying to elongate my body and do whatever I could to make my stride more efficient. There was nothing I could do. I felt like a soldier in a suit of armor. I felt as though I was just along in this hollow suit hoping it had the momentum to carry me across the finish line. I hadn't looked at my watch for some time now and it wouldn't have mattered anyway, I was delirious. 400 meters to go and the crowd was getting louder. I thought I had missed my time limit goal for today due to the wind but as I crossed the 42km mark, (200meters to go) I could see the clock display below the finish line banner and it read 2:34:??. My spirits were instantly lifted and I swung my arms desperately trying to gain some more momentum toward the finish line. That only worked for 5 meters or so and it was all I could do but hold on and ride it into the finish line all the while my eyes focused on the clock. I have owned the clock this whole way until the wind started to own me. And now there was nothing left to do. I could swear that the clock said 2:34:59, the final time was 2:35:00. I gave one last push with my legs as I crossed the line and fell helplessly into the comforting arms of the volunteers. I stumbled and fell to the left and they picked me up and set me straight. I stumbled and fell to the right as they cradled me back over my feet again. As I regained my balance I was funneled into the finish area where I saw Kevin O'Connor waiting for me. We had a huge hug and congratulated one another on meeting our goals. After this we were guided to some chairs wear the fantastic volunteers attended to our needs bringing us all kinds of refreshments and ice for Kevin's calf. I had a hot chocolate followed by a Gatorade and then a water. I had another Gatorade after that. I untied my shoes which were making my feet numb now that I had stopped. We were then politely asked to leave as the masses would soon be flowing into the finish area. I saw Graeme and shook his hand. It was amazing to come in one minuit after him and just a few behind Gramps. Three men from VFAC in the top ten overall in one of the largest marathons in Western Canada. How exciting to be a part of our team today! I grabbed a bit more food as I passed through the finish area and was wrapped in a plastic marathon blanket. The sun was shining particularly bright upon one very green patch of grass and I placed my blanket down and set my snacks aside. I lay down and enjoyed the sun's warmth as I stretched. Within moments the reality of what had just happened, the immense journey I had endured to meet my goals, the fact that "YES!" I had met my goals and the sheer joy that accompanied their completion swept over me. I started to weep! I'm not talking a little sniffle either, I had my head in my hands and was shocked and thrilled and overwhelmed and the tears rolled down my face as I soaked in the moment. After collecting myself and recovering slightly I got up and made an attempt to get my bearings straight. I found several team members including coach Hill but could not find my friends who I was staying with or my hotel key. My feet were getting very tired and sore by now and I was starting to get delirious again. I started the walk back to my hotel and even tried to jog a few times. That was not happening without some agony, so I flagged down the next car and they were kind enough to pick me up. Some tourists from Toronto dropped me off back at Paul's Motor Inn where I was delighted to see the room door open. TK and Rod were in the room and I flopped down onto the bed. I hopped into a hot shower and enjoyed the feeling of my muscles unwinding under the soothing water. We packed up the room and checked out and stopped off at this Mexican restaurant for some lunch. We were cutting it close by this time in regards to our timing for the awards ceremony so we explained that to our server and had them make it to go. Rod and I had a Corona and TK had a margarita. The staff had heard how well I did on my first marathon and brought me out a deep fried ice cream on the house! I couldn't imagine a tastier indulgence after draining myself so thoroughly. The staff there were fantastic and had us out the door in good time to make it to the awards. It looked as though the entire team (minus a few) were in attendance and rightfully so. We won the men's and open team award and there were VFACers up on stage for almost every single age group. Notable mentions of course to our club champion Kevin O'Connor who took the award ceremony by storm snatching up every prize he could have won and triple dipping in the money pot as well. After that we were all buzzed with the excitement of our achievements and thirsty for the evening's celebrations. We went to an Irish pub where there was an ice cold pitcher bought for me which I happily drank the whole thing! After that we all went out for dinner. I had Shepperd's pie and more beer. It had been some time that I had been refraining from drinking beer so I was letting it all hang out now. After dinner and more drinks, the dinner table moved to the dance floor. It hurt to dance, but us VFACers are troopers and live for the party. There were some other teammates at another bar where the music was better for dancing so we went to join them. We all danced and partied until 2am. I ended up in Kevin's room at the Empress Fairmont. The party was over fairly quickly after that as we had all endured a long day. Three tired VFACers in one bed and one snoring girl in between two guys. Just another race day in the life of a Vancouver Falcon. What an experience! Thank you to all of my readers who have been so patient in waiting for this post. As well as training for this race, I also moved into a new place and started a new full time job on top of running my own business. It took me a period to adjust and settle back into my routine with new room mates around. I hope to post more often now that things are leveling out. I hope everyone is staying healthy during this transition into the colder months. Stay tuned for the up and coming New Balance Fall Classic Half Marathon post race report! Well, finally belated details of the infamous first marathon! Excellent writing, David and with such a sharp memory and great wit. One of my mother's last long sentances before she passed away last year was 'Why does David remember his racing but never anything else?'. Because David can focus on his goals and accomplishments and knows how to keep up the determination and enthusiasm. I'm so proud of you, David. Well written David. Keep all of these entries for when you write your book!